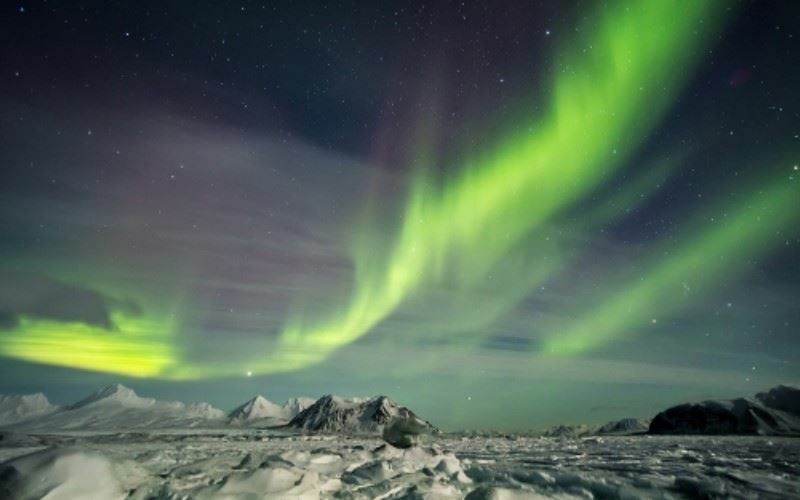 The high-Arctic archipelago of Svalbard has already witnessed the first snow of the season and the return of the Aurora Borealis (Sep18). At 1000km south of the North Pole this, surprisingly, well-connected destination can offer a 'winter' experience at the height of our autumn. As the UK moves into winter, Svalbard is experiencing the period of the polar night when the sun does not rise above the horizon. This is a magical period of the year when twinkling stars, moonlight and the waves of candlelight accompany you on your journey. At this time of year it is possible to observe the graceful waves of the northern lights during the day. On arrival, self transfer to Longyearbyen using the airport bus service. Your accommodation is Funken Lodge, a recently remodelled boutique hotel with panoramic views over Longyearbyen from its elevated position. The property offers accommodation of a high standard and boasts a well-regarded restaurant that is popular with guests and locals alike - there is an impressive cocktail menu on offer too. Overnight at Funken Lodge in Longyearbyen. Day at leisure in Longyearbyen. Take the opportunity to visit the Svalbard Museum and the world's northernmost brewery, and to spoil yourself in the local shops. Svalbard is not subject to customs and VAT regulations which means that many goods are cheaper than those purchased on the Norwegian mainland. This evening, we have included a 3 hour Northern Lights safari by snowcat. The tour will transfer you away from the artificial lights of the town into the darkness of the Advent valley. For those of us who live in cities, it is rare to experience total darkness; a darkness in which all of your senses are heightened. In this environment, it is all about you and the nature. Here, your local guide will tell you stories about the Aurora Borealis whilst you keep your eyes peeled looking for her arrival. A hot drink is included. Day at leisure in Longyearbyen. Sunvil can pre-book a range of activities for our guests including guided tours of Longyearbyen, hiking, beer tasting, snowmobile tours and dog-sled excursions. This evening we have included a relaxed evening at a wilderness camp on the outskirts of Longyearbyen. A hearty meal, roaring fire and a fascinating presentation on the polar 'fireworks' are featured. Your location, away from light pollution, offers the perfect conditions for viewing one of the greatest natural phenomenon in the world, the northern lights. Self transfer to Longyearbyen airport, using the airport bus service, for your return flight to the UK.